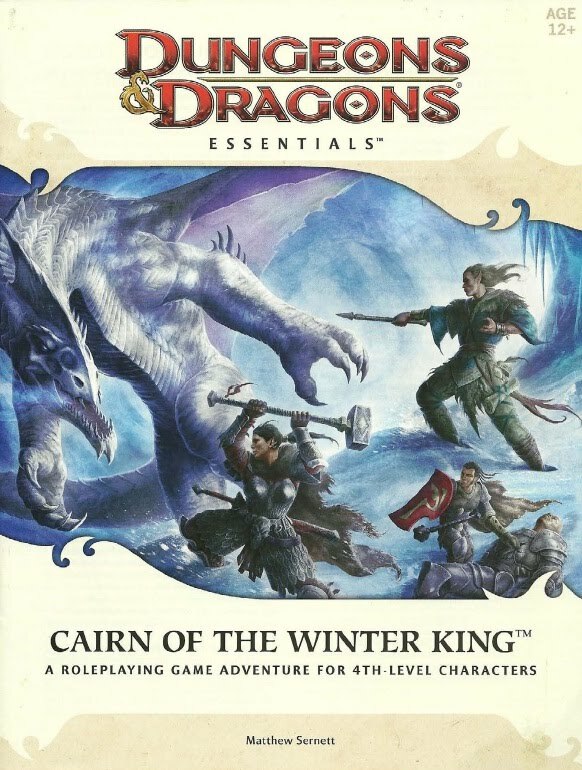 Of all the premade adventures I have run so far in my 4E campaign, I think Cairn of the Winter King is my favorite. As an old schooler returning to D&D after a long hiatus, the Winter King’s lair was was far more comfortable for me, since it is very much a classic-inspired dungeon. I also loved the roleplaying opportunities that the early winter provided, and the flying Viking longship full of zombies and skeletons was a great encounter. Ravide the Black made a memorable NPC, one that I have used extensively in my campaign. There was even a dragon; what’s not to love? This is not to say, though, that the adventure was flawless. One of the biggest problems is the fact that it is entirely possible for the “final” Winter King encounter to happen fairly early in the adventure. There’s not much that can be done about this issue, really, without seriously railroading the party into exploring the rest of the rooms first. My group defeated the Winter King before they had even stepped foot in half the rooms. There was more treasure and XP to be had, sure, and they wanted to explore the entire place. But anything further would be anticlimactic; once you’ve killed the big bad evil guy, even slaying his most trusted lieutenant is a downer. I decided I needed something big and exciting to wrap up the adventure properly. Luckily for me, my players had not explored the room with the frozen white dragon yet. I decided I would end the adventure in a very cinematic and memorable fashion: the white dragon would chase the players as they escaped on the flying ship. I figured combining their first encounter with a dragon with the novelty of a fight on the impressive flying ship would be a fitting end to the tale, and it was. I decided to share this encounter in the hopes that it might help some DM out there who was struggling with finding a good ending to the Cairn of the Winter King like I did. Alternately, this encounter could easily take place in other campaigns. As long as the party is in a boat, train, Spelljammer, or whatever, and there’s a large, mobile monster that can chase them, this basic framework should work nicely, with a few alterations. The way I ran the encounter was much different than the standard battlemap and mini-based combat that 4E generally provides. There are several reasons why I wanted a more abstract and free-flowing encounter than a strict, “by the books” fight. First of all, I wanted the big finale to be unique, far different from what they were used to. Secondly, I didn’t want to burden the encounter with additional rules for flight, like elevations, headings, and the like. 4E combats run fairly slowly anyway and the last thing I wanted at this point was more complexity. Lastly, I didn’t have (or want) a battlemap of a flying icy longship anyway. 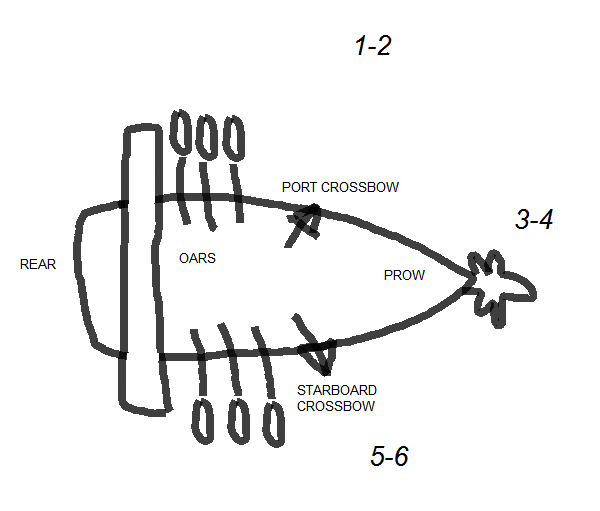 I drew a diagram of the basic locations of the ship: the oars, two crossbows (one on either side), the prow, and the rear of the ship, including the mast and sail. I instructed my players that they would be able to use their movement action to move from their current location to any other, as they saw fit. Each section of the diagram had something for the players to do. Please forgive the crudeness of the drawing. Oars – The oars needed to be rowed in order to make the ship fly. I told my players that two medium Athletics skill checks would need to be made each round, or one person could make a hard Athletics check and give up their standard action instead. If the skill check was failed, the ship would begin to fall, causing each player on the ship to make an Acrobatics check or fall prone and lose their next standard action due to the loss of footing and difficulty of moving in freefall. Crossbows – These were handled by using stats pulled directly from Sly Flourish’s DM Cheat Sheet. Any player could use the crossbow, which magically created its own bolts at the beginning of each round, to attack. +10 vs AC, 2d6+6 damage. Rear of the ship – I knew I wanted the dragon to damage the sail at some point, which would require a PC to make a hard Acrobatics check (climbing the mast) and a medium Athletics/Thievery check (repairing ropes on sail) to overcome. This was where that PC would need to be standing. Prow – The bearer of the Ice Scepter needed to stand here in order to channel the power of the item into powering the crossbows. Each round, this player would have to make either an easy Arcana check with a standard action, or a hard Arcana check with a minor action, in order to keep the crossbows up and loaded. An additional wrinkle made the combat even more interesting. The dragon would, after each action (the 10+ initiative attack and the standard turn), move to either the port, starboard, or forward sides of the ship. This would limit who could attack it with a missile weapon. When I ran the fight, I just explained it to my players, but it was a bit confusing. I created a chart to be used to determine the position the dragon would fly into, and who could and could not hit it. This allows your players to have a few options, and significant decision points as to who is going to cover what area. Also, the die roll added a bit of drama to the fight; where would the dragon end up this time? I was excited and curious to see how the fight developed, and whether my players would enjoy the more loose and open method of resolving the battle, which was really quite different than the typical 4E encounter. Though there were a few hiccups, the big finale went quite well. My players really seemed to be enjoying themselves, and it was a blast to run as a DM. It felt like we were “breaking the rules” of 4E a bit, and this somehow added a sense of excitement to the fight. Here are a few things I learned from running this encounter. Being the oar guy is boring! The slayer in my group, with no real ranged capabilities to speak of, took on the task of the oars all by himself. This meant his turn consisted of a simple skill check roll. That’s hardly ideal. I tried to make up for this by having Ravide the Black help row every once in a while as well. This freed up the slayer to use Heal on others during the fight, a nice role reversal. Still, I felt like I could have had him do more. Speaking of role reversals, it was quite fun to see a shaman and paladin manning the crossbows. They were able to do some nice damage at range, something that both classes struggle with. I think they enjoyed the change of pace. The thief and mage were the all-stars, for obvious reasons. I don’t have a problem when a couple members of the party far outshine the others, but it’s not something I want to do all the time. I was sure to spotlight the unique abilities of the other players in the next few sessions. Everyone should have a time when they get hive fives and the rest of the party wonders how they’d ever have made it without them! By all means, make sure the fight ends with the defeated dragon falling away just as the ship starts to melt and lose altitude quickly. The dragon could come back as a recurring villain, with a huge grudge, and a seat of the pants splash into the waters of Fallcrest just in time is a great way to end the adventure. Your players will feel like rock stars, for sure. I hope you found this encounter interesting. The Cairn of the Winter King is a fantastic adventure, and it deserves to have a fitting ending. Hopefully, the scenario I described for you here gives you a few ideas to use in your own campaign. If you do use it, please let me know! I’d be thrilled to hear how it went in another gaming group. Wow this is really well thought out! I’m gonna be running a game of CotWK over roll20 soon, and if my pc’s make a mad rush to the winter king I’m gonna use this as the finale. I really want to know how hard this adventure is for 4 or 5 players, one of which is having played before and the others being their first time. I’ve heard that the encounters are pretty tough. I’m glad you enjoyed the encounter! Let me know how it goes if you end up using it. My group had five players, only one of whom had more than a month’s experience with D&D. Some of the fights were very tough. I had Ravide the Black tagging along with the group as a sort of guide, and used him to aid the PCs when things got particularly tough. Might be an option, depending on what your players do.